My husband was very unhappy with his "regular" wallet, too bulky in his pocket. Decided to try this and it has been working out great. He really likes the smaller size and that it holds what he needs to have with him. This is great. Small and light--holds just enough. Price point also very nice. i got this as a gift and it was just the thing . everything fit in the space provided. I am completely satisfied with this wallet. Unique and so well made! 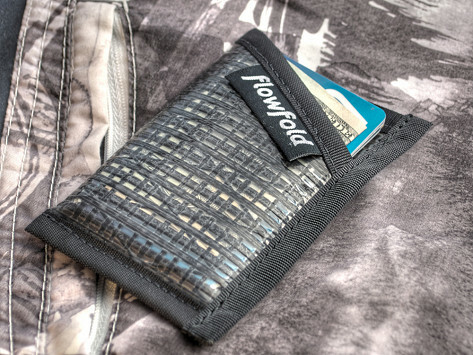 I was so excited to receive my Flowfold minimalist wallet! I love the look of it, it's tough, it holds more than you think it would, and it fits perfectly into my running belt. I keep my driver's license and a credit card and a $5 bill in here, so when I go out, I don't have to carry a purse. I can tuck this in a pocket, or my bra...and I'm 65 ! I have in recent years several wallet purchases. Until now I have truly made an exceptional wallet purchase. I really enjoy Flowfold size. I would like to suggest that you make one where one could place one's Driver License on the other side to the Flowfold. I would recommend this product to my family and friends. I kept 1 wallet, and gave the other to a friend. I'm female and old, so I put my ID, a credit card, and $20 in it, and keep it in my main wallet...easy to take out and use when walking, beaching, or making a quick run to the store. I get tired of carrying a purse, as it gets too heavy. If I don't have a pocket, I can tuck it inside my bra. Haven't tested the waterproofness or floatability yet. My friend never carries a purse, so she really loves this...does the same as I do. Going to order more for my sons, as they actually do water sports. Built from some of the strongest, lightest, and most resilient fabrics in existence, Flowfold’s carrying gear could outlast you. As a teen, Chuck Friedman worked a summer job in Maine repairing high tech sails for the world's most elite racing boats. Industrial sewing skills he learned there, mixed with good old New England practicality, led him to construct his first wallet from scraps left on the cutting room floor. Several years and countless prototypes later, Chuck and friends bootstrapped their way into business. The name Flowfold references layers of rock that fold smoothly over time without breaking, illustrating their central design philosophy: The strength of flexibility. Before long, the team was producing all kinds of outdoor gear using their unique materials and innovative designs. The Minimalist Wallet is super simple and slender, while the Vanguard provides just a bit more room with a cash pocket, two hidden card slots and two I.D. windows. The Traveler is ideal for those who need to accommodate more paper, plastic, and international bills. For shelter in a storm, look no further than the ultralight and rugged Stormproof Tote.